Born in an era when physical training meant running alongside the school bus and shadow-boxing the cigar tree outside his house, Muhammad Ali went on to become the world’s supreme heavyweight boxing champion, delivering blows to his opponents and to society’s racial prejudice, in equal measure. As a young child, I was perplexed by Muhammad Ali’s on-camera pronouncements of his superiority to all-comers. I had been brought up by a Basque, spinster nanny to believe that personal vanity in the eyes of God was a sin. But watching her lean into the convex fish bowl of our 1960’s television set, straining to catch his every move and jab, opened up a horizon of excitement, and questioning. With every fist he pumped into his adversary’s body, she would let out a fruity squeak of delight, sit back for a moment and glance sideways at me through thick black-rimmed glasses, shaking her head in admiration and seeking my full complicity in his evident greatness. Cassius Clay as he was then – sounding more Roman emperor to our Mallorcan ears, than African-American from Louisville, Kentucky – contradicted all that we both prayed for at night before bed. And we both stared in awe as he pummelled British boxing champion Henry Cooper in 1966, with the Arabic hieroglyphics and “jala jala” music of a nearby interfering Algerian programme bouncing across our screen. Muhammad Ali’s characteristic weaving and lightness of feet were combined with the speed, power, and killer instinct of an Orca pouncing onto shore to drag off an unsuspecting penguin. But Ali was also the embodiment of how we can elevate ourselves to become greater than the sum of our parts. His physical agility was matched by his mental “chutzpah”. He did indeed “float like a butterfly”, above existing barriers of injustice. This inevitably brought with it controversy, spurred by his love of attention and a lack of educational achievement that life later seasoned with a gentler reasoning. Driving him was the belief in his own power as a communicator for all men, not just of his own race – “I don’t have to be who you want me to be; I’m free to be who I want”. His early stages of militancy were Mandela-like, fed by anger and indignation; the two young men even resembled each other. And his often scarily anti-establishment attitudes, embracing what to many was a sinister branch of Islam led by the telegenic Malcolm X, were motivated by a visceral rejection of the wrongdoings between men. When he lowered his sledge-hammer hook outside the ring, it was like the martial arts master who knows that his skill could kill someone outright, but who prefers to channel his argument through dialogue. Possibly the first ever rapper, he became an eloquent objector of all that was the norm of white male America. Asked if he would change his name legally to Muhammad Ali, his eyes narrowed at the implication of his non-legitimacy and with the same defiant look behind Sydney Poitier’s simmering, seething comment: “They call me Mister Tibbs”, in Norman Jewison’s directorial heads-up film of 1967, “In The Heat Of The Night”. Facing jail for his refusal to fight in Vietnam, he was stripped of his world championship title. His declaration in 1966, “I ain’t got nothing against them Vietcong,” was shocking, but, in retrospect, as courageous as the Hollywood figures who refused to out their communist colleagues in the 1950’s. His own racial insults, for example calling his ring opponent and fellow African-American, Joe Frazier, “the gorilla”, were head-scratching inconsistencies – at one level child-like and, at another, a concerted attempt to escape his ethnic stereotype. Driving him was the belief in his own power as a communicator for all men, not just of his own race – “I don’t have to be who you want me to be; I’m free to be who I want”. Nor would he kow-tow to the conventions of the roped cage in which two blacks slugged it out for the entertainment of a white majority. Accepting the sponsorship of eleven white millionaires when he turned professional at twenty, simply fired his poetic acumen: “They got the complexions and connections to give me the right directions”. 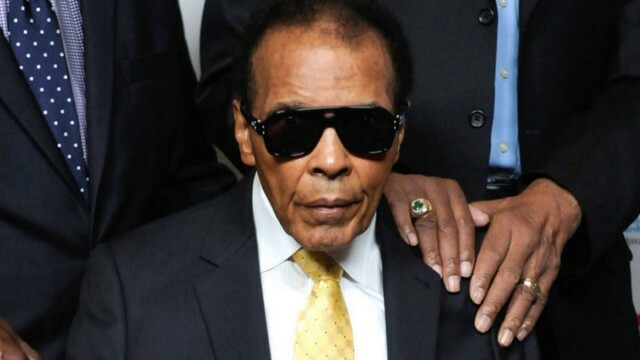 Like the Spitfire pilot who grows deaf after combat, Ali accepted a fate felled by Parkinson’s disease – more than likely the result of years of physical pounding – with sweet courage and dignity. We will miss his character; a “Prince Ali”; flawed but human with a touch of royal status, fighting the corners of those still struggling for acceptance and fist pumping indeed, of generations whose identity he helped define.